Solar Gate Solutions W.A. is a family owned and run Australian business that provides quality equipment and excellent service. We have been installing automated gate systems in the Perth hills area for over 10 years and we carry a comprehensive range of gate systems and accessories in stock so we can usually supply without delay. All of our systems can be powered by solar or alternatively main power if available at the gate site, and for solar installations, we use a large upgraded 40-watt solar panel to ensure reliability during the winter months. If you would like a free no obligation quote just contact us and we will be happy to arrange an appointment to meet with you to check the suitability. Furthermore, we will discuss your system requirements, or alternatively, as a price guide we are able to supply an estimated cost if a site visit is not wanted or convenient. 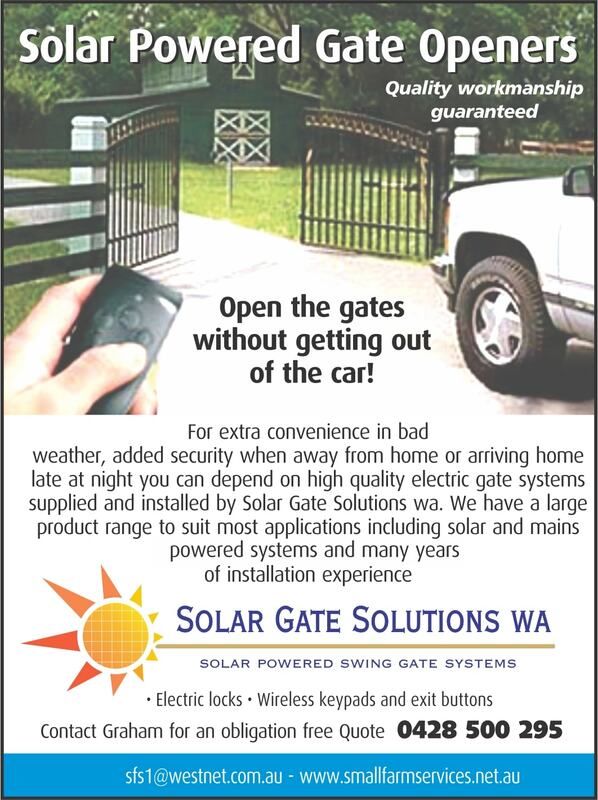 A solar powered gate system to suit an existing single swing gate can be supplied and installed from as little as $1795 Inc GST using the high-quality Letron gate systems that have been manufactured to the highest standard for more than 30 years.